The weather is getting warmer and suddenly staying in bed all day with Netflix isn't such an attractive Saturday afternoon. Now that summer is here (or at least it sure feels like it to me) I tend to pull myself out of my hermitage and venture out into the real world. One of my favorite activities during hot weather is to hit up the local amusement park. While I wish I was already in LA and within driving distance to Disneyland, there are still some pretty good options around where I live. After being a season pass holder last year I've discovered some essentials that are completely necessary for a trip to the park. If you're crazy like me and despite knowing that your makeup will melt off in the hot weather but still insist on wearing it, two items are key to maintaining an acceptable face. These things are a small mirror and some oil blotting sheets. Normally I do not advocate oil blotting sheets because I find they do more hard than good (think about it, you're pressing oil back against your skin in the process), but when you're out frolicking these are a necessary evil. With long lines in the hot sun and a wealth of water rides, these things are key for checking up on your makeup and staying shine free. Personally I'm not a fan of closed toed shoes, but a trip to the amusement park requires some sturdy footwear. I compromise with some really secure (and comfy) sandals. When I say secure, I mean you want to be able to flail wildly while dangling from a tree branch and those sandals aren't going anywhere. A lot of roller coasters out there are the ones where you dangle your feet down and obviously flip flops will fly off, with a nice pair of strappy sandals your toes are able to be free and you won't need to take your shoes off because who really wants to be walking bare foot in any part of a public park. After going on a million rides your hair will start looking kind of crazy. This may seem like a no-brainer but having a hair tie or two is key to eliminating all nuisances when you're having fun inside. My last essential may seem like a random one, but a plastic ziploc bag will be a lifesaver. Placing your phone and other hydrophobic items inside before the log ride will be a lifesaver, just trust me. 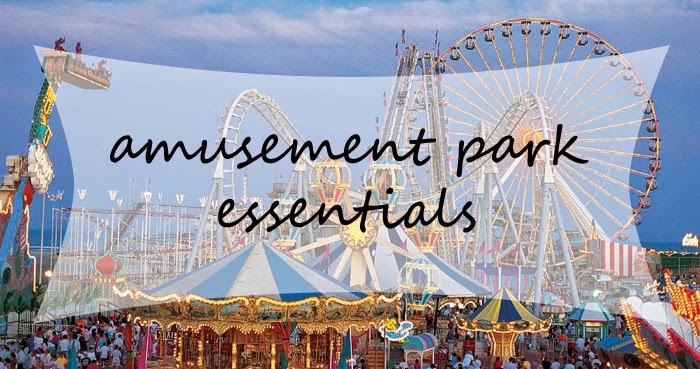 What are some of your amusement park essentials?